Happy summer (If it’s summertime where you are!)! I hope you are enjoying the weather and the extra family time. I don’t have little ones in school yet, so for us, summer means lots outside fun, and of course, whining at bedtime because it’s still light outside. If you are still doing yard work and have a bit of yard waste, I hope this post finds you at a good time! 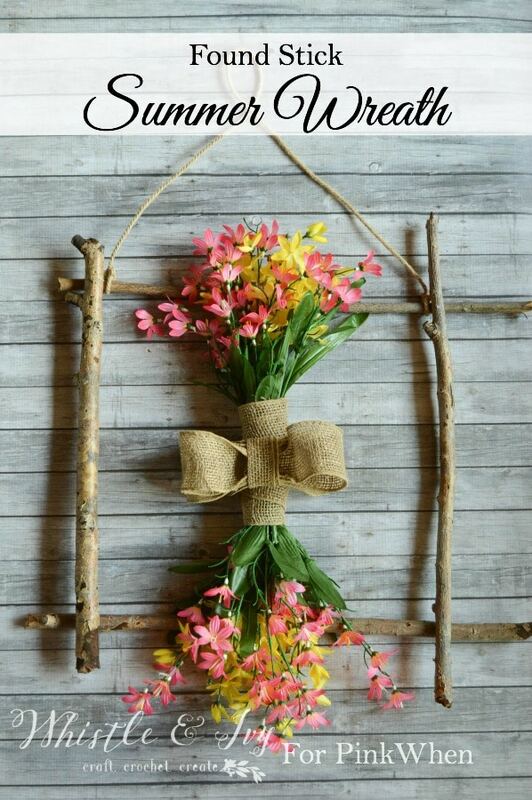 I used a few sticks that I raked up in our yard and made this pretty summer wreath. It’s quite rustic, and I love how it turned out. It’s a quick wreath project that you can make in about 30 minutes, so get outside and gather up some sticks! I am over at PinkWhen sharing the full tutorial, so hop over and get the deets! Don’t miss a thing! Subscribe to Whistle and Ivy here. Happy Wednesday everyone! It has been mild and wonderful here (except for a couple days when we got some much-needed rain)! I love springtime, and we have been spending lots of time outside. I have been digging my vegetable garden by hand because I am nervous about digging up the sprinkler system with a tiller. But it has been a wonderful excuse to be outside and get some exercise. With these beautiful and sunny days, I have been wanting to make a suncatcher to hang in my kitchen window. I am sharing this easy tutorial for this faux-stained glass suncatcher today at PinkWhen! Click over to PinkWhen get this Faux Stained Glass Suncatcher tutorial, and happy Spring! I hope you are enjoying the weather, wherever you are! Don’t miss a post! Sign up for my post updates here. Hello lovely readers! 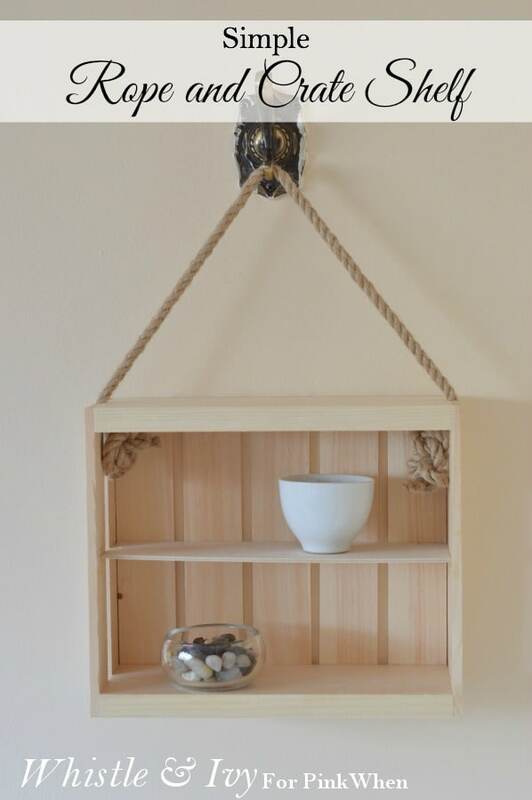 Today I am over at PinkWhen sharing the tutorial for this easy and lovely rope and crate shelf. 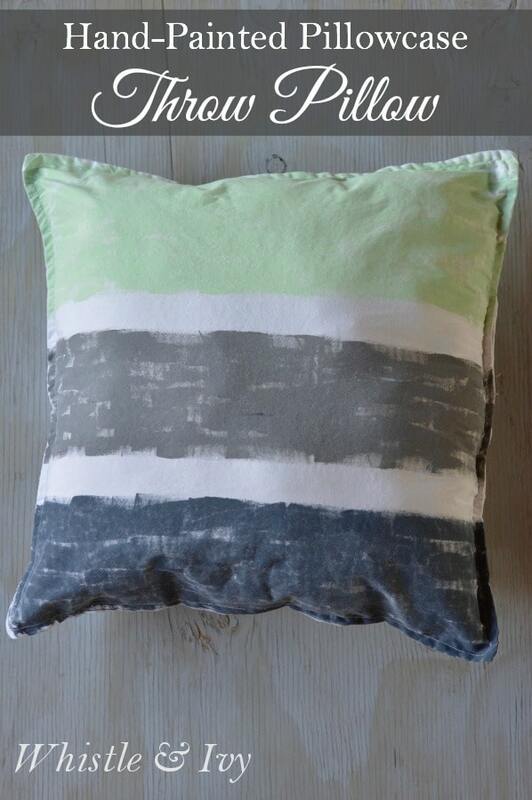 It is SO easy, and I love how it turned out. You only need a few supplies and a free afternoon (which may or may not be hard to come by!). They are so quick and easy, I think I will put a shelf in each bathroom. Head over to PinkWhen to get the tutorial. Hello everyone! I am guest posting over at PinkWhen today! Do you have some old maps lying around? 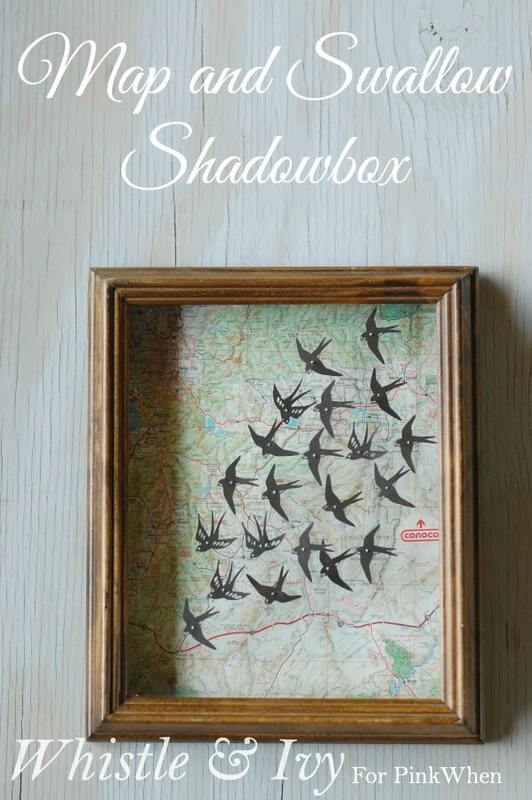 I am sharing the tutorial for this cute map and swallows shadowbox; it’s a perfect project to use them on, and a great gift idea as well! Click here get the tutorial for this map and swallows shadowbox at PinkWhen!